World War II has ended and American women are shedding their old clothes for the gorgeous new styles. Voluminous layers of taffeta and tulle, wasp waists, and beautiful color—all so welcome after years of sensible styles and strict rationing. Jeanne Brink and her sister Peggy both had to weather every tragedy the war had to offer—Peggy now a widowed mother, Jeanne without the fiancé she’d counted on, both living with Peggy’s mother-in-law in a grim mill town. But despite their grey pasts they long for a bright future—Jeanne by creating stunning dresses for her clients with the help of her sister Peggy’s brilliant sketches. The Dress in the Window by Sofia Grant is the story of three women living together at the end of WW11. That time from 1945 to 1952 when America is recovering from the hardships and losses of the war. Thelma, Peggy and Jeanne are no exception. Both the girls who are sisters have lost men to the war as has Thelma, her son Thomas - Peggy's husband. With the three women is also Tommie, Peggy's daughter. They scrape the pennies to live together and make do. The story is told in turns by the three women and so the reader gains interesting insights into each of them, things that are not known often by the other two. I did not like some of the things each of them did but I felt sympathetic towards them all and could understand their longings and desires to matter and have purpose. Let's just say secrets abound in this book and each revelation certainly changes things up. Some I just did not see coming. Men are mostly conspicuous by their absence and when present mostly are not that well mentioned for their faithfulness. If you are interested in how women dressed in this era and the fabrics that were around and how fashion was changing at this time then the story will hold extra interest for you. Jeanne is a seamstress and delights in sewing up costumes, Peggy while not as clever as her sister and a bit of a rebel has artistic skills that see her developing her own path. There is much sisterly affection and some petty differences that cause problems. Choices made are not always appreciated by the other. Thelma on the surface is quite different to Thelma in the depths. An interesting character who makes mistakes but really is a strong woman and helps out Peggy and Joanne where it counts. 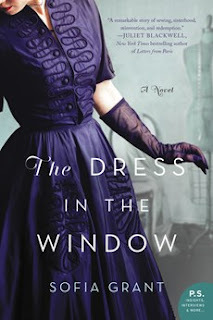 I enjoyed The Dress in the Window because it was set in the time just before I was born so I could relate to it easily. The intricate interrelationships had me reading on wondering where it would all end. I was pretty satisfied with the ending although I did wonder about the changes for Peggy, would she really have changed that much? I LOVE the cover, and your description, your thoughts, and your review make it sound VERY good, Kathryn. I love this era, too, and even after the time of this book, taffeta was a fabric familiar to some of us...especially in bridesmaid's dresses! Thanks for sharing. I noticed this one, but didn't give it a closer look. Glad to get your reader thoughts on it. Might have to give it a go. I've been interested in this one since I first saw you mention it so I'm really excited to see your review. This does sound interesting and I'm fascinated by the fabrics and the patterns of fashion so that's definitely a draw for me. I love this time period and it is interesting to see life in post-war America.